Formed by guitarist Dave Harvey (Aska) in 2010, Millennial Reign has been traveling under the radar in the American metal underground. 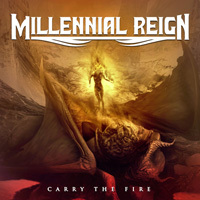 While this is my first experience with Texas based band Millennial Reign, I can't help hearing something familiar when listening to their second album Carry The Fire. Harvey and cohorts play traditional melodic heavy power metal which absolutely explains why they get no notice in the States. Yet, there's something else to their sound. Yeah. They remind me of an American version of Iron Maiden, maybe touched with a little Queensryche as well. Some of this has to do with their fundamental twin guitar sound, but also the timbre of James Guest's vocals, a vague cross between Tate and Dickinson. Although, on this album, he has a stronger presence than Dickinson than has on their new album Book Of Souls. This aside, more fundamentally, Millennial Reign sounds more like an European power metal band than the large majority of the current American modern harsh metal bands. That's a good thing. MR takes their twin guitars, melds thick riffs with intentional harmony and then adds the requisite thrilling guitar solos. Underneath the band's rhythm section powers the tempo which ranges from basic moderation to the speed of true power metal. When the elements are applied, Millennial Reign's sound can sway between brisk and epic as with Way Up High or Will You to something more bracing, bristling with riffage, like Not On My Own. Alternatively, there's something more fundamental with Men Stand Alone, driven by a steady, almost laconic momentum, in the first half, it eventually rises upon the refrain and those fiery solos. Another twist, though hardly unexpected for their genre, Innocent Cry invokes some symphonic orchestration at the start, either from keys or guitar synths, that adds depth to the sound, embellishing the riffage. Like other songs here, it gives the entire song that bombastic quality. Bottom line? 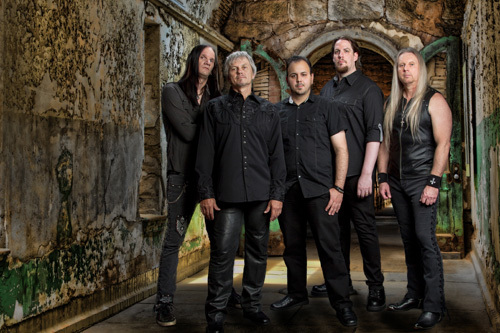 For classic melodic heavy/power metal, a twist of the American with its European cousins, Millennial reign is the real deal, authentic and entertaining. Recommended. 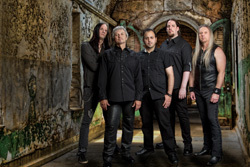 For classic melodic heavy/power metal, a twist of the American with its European cousins, Millennial reign is the real deal, authentic and entertaining. Recommended.